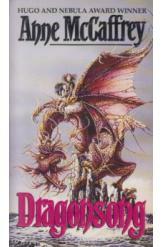 Dragonsong by Anne McCaffrey, Sci Fi. Book is in good condition, all pages intact. Frustrated musician Menoly escapes her dreary life and stern father at Half Circle Hold by using the chaos of the periodic Threadfalls to run away. In the wilderness, she befriends the mythical fire lizards, and when she teaches them to sing finds herself getting attention from across Pern. Part of the Dragonriders of Pern series.